Jump in and don’t hesitate. As women we often wait to act until we are confident in our knowledge base. But in the blockchain space, waiting means losing opportunities because this ecosystem moves incredibly fast. Realize there are very few genuine experts and that we are all beginners. I grew up in a rural one-stop-sign farming town in Northern Utah, welfare poor, where I was often reminded education was for boys especially in my family where no one pursued a college degree. And being mixed race, the daughter of an immigrant mother, I was isolated having significant barriers to break. So when I had my blockchain “ah-ha” moment, I fell in love with the technology because of its potential to reduce barriers for people around the world. And I found my professional purpose, even though I had no prior technical background [not even using social media]. But when I searched for developers and investors for my startup based in Southern California, I couldn’t find anyone. Frustrated, I went back to my alma mater, University of California Los Angeles (UCLA), and co-founded the UCLA Blockchain Lab to develop a pipeline of engineers, innovators and leaders. Since then the Lab has grown into the Los Angeles Blockchain Lab, a partnership of academia, government and business collaborating with LA City, Panasonic Ventures, numerous businesses and various groups at UCLA, University of Southern California, University of California Irvine, and Caltech focused on building a sustainable blockchain ecosystem in Southern California and abroad. Because I don’t have a technical background, it was intimidating to learn about blockchain, to launch two blockchain based startups, and especially to teach others about the technology. But, the lesson I learned is that you don’t have to be an engineer to help build this blockchain ecosystem. Rather, all types of professionals and diverse backgrounds are needed for mass adoption of this technology and for this social experiment to succeed. The LA Blockchain Lab and its partner, USC Viterbi School of Engineering, are offering blockchain training, coding classes, and mentorship to a young women’s technical school in Afghanistan with the hopes of eventually connecting them with internships and jobs. And my other venture Proof-of-Art, a blockchain based social enterprise platform, provides business solutions for artists, entertainers, and all types of content creators. I am very proud of it winning a business competition at Sir Richard Branson’s Blockchain Summit, an event focused on blockchain and social impact. After immigrating to the US, my mother, a former actress in her home country, ended up scrubbing toilets to support her children. But she always remained thankful, positive, and helpful to others in need. She taught me that attitude is often a choice. So when I fail or my plans derail, rather than becoming angry or depressed, I rely upon her example of strength. I’m not always successful, but I try to remember I am incredibly blessed and that life is all about improving both my life and the lives of those around me. Blockchain is a technological advancement and social movement because of its potential to democratize knowledge and wealth, ensure fair labor practices, protect voting rights and democracy, reduce barriers, and increase opportunities for all people, especially for the underprivileged. Therefore, building a sustainable blockchain ecosystem should improve the world. As well there are tremendous financial opportunities with blockchain related careers and innovative startups. But these opportunities should not be limited to the Ivy-League-educated or typical Silicon Valley engineer. As such, it is my aim to empower people, especially women, minorities and the under-represented, with this technology so they too can reap just rewards of this new industry and be fairly represented in this new social experiment. I’ve had the opportunity to speak around the world, most recently returning from Juarez, Mexico, sharing the vision of blockchain and its many career opportunities. And through the LA Blockchain Lab, we are building training and events for at-risk-youth both in Southern California and abroad. If you are career transitioning, I suggest enrolling in a university-based extension course, attending blockchain meetups, and interning or volunteering for a startup to build your resume. Meetups are an excellent place to connect with startups looking to hire. Keep in mind, all types of positions are in great demand including coders, marketers, accountants, attorneys, business developers, etc. And because few people are experts at this time, these few steps will help propel your career. If you are an entrepreneur, connect and engage with startups and the general blockchain community. Find ways to collaborate or partner so you don’t have to reinvent the wheel for all your blockchain-based business needs. There may even be opportunities to share valuable resources. For the most part, it’s in the blockchain community’s dna to be transparent and to help each other thrive as we build out our blockchain ecosystem. To break the blockchain-bro stereotype, we need to see more female leaders speak at events and conferences, and not just on “women and blockchain” panels but also to discuss engineering and projects. I 100% disagree that there are not enough women experts to find. Our partner, [email protected] hosted perhaps the world’s largest Women in Blockchain Conference engaging only female speakers to discuss protocols, careers, and projects which attracted over 400 attendees both male and female! 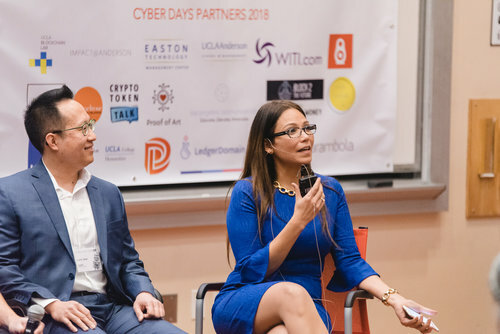 And when curating blockchain global leaders for the UCLA Cyber Days Conference, by coincidence, the majority of keynote presenters were women. Startups are building the foundation of the blockchain ecosystem and have the opportunity to integrate social impact and inclusion initiatives for both women and underrepresented groups. These startups often utilize messaging apps to build their community which is essential in the blockchain space. Here is an opportunity to directly encourage and hold accountable the founders by asking them to publish their strategy to engage women and be more inclusive. Our ability to connect with the non-blockchain community, including women, has been painfully slow because much of the terminology is overly technical and often used for multiple purposes causing significant confusion. In addition, most of the mainstream discussion has been centered around crypto-investing which has a predominately male audience. To engage more women, we need to shift these discussions from technical jargon and money making schemes to describe more real world use cases and social impact opportunities. Lastly, women are the best communicators to other women but often refrain from sharing their knowledge because they either don’t feel confident or don’t want to impose on their friends. But, this simply puts us at a disadvantage as we continue to lose out on tremendous opportunities due to a lack of awareness. So, I strongly encourage women to engage other women by sharing their blockchain knowledge and experiences. My favorite quote is “create more than you consume.” But during my past career in financial services, I was more a consumer than a creator, focusing primarily on money not finding a healthy balance between taking and giving which ultimately left me feeling shallow and unfulfilled. Where I did receive fulfillment was from the arts, an industry where artists so often give more than they receive. And so I co-founded Proof-of-Art, a blockchain based social enterprise platform providing business solutions for artists, entertainers, and all types of content creators so they can focus on what they do best, create. It was an honor to win a business competition at Sir Richard Branson’s Blockchain Summit where 40 global thought leaders were invited to address blockchain’s potential for social impact. Living in a bubble in an area known as “Blockchain Beach” in beautiful Santa Monica, it is painful to realize that most women around the world are still gravely underserved, many living lives of modern-day slavery. Financial independence for women may be the best solution to combat these horrific practices. Because we have a global shortage of blockchain coders, and because coders can work remotely and from home, empowering women and underserved people with blockchain coding skills may be a tool to help build their financial independence and improve lives. Ultimately, I’d like to extend beyond coding skills to helping people in deprived parts of the world initiate successful blockchain businesses. Please follow me on Twitter at @heidi_pease, join the “Women and Blockchain” WhatsApp group, and sign up for our mailing list at www.losangelesblockchainlab.org.